There are four places of pilgrimage that are considered a must-visit for all Buddhist practitioners of all traditions. One of these places is the Buddha’s birthplace in Lumbini in present-day Nepal. In 245 BC, Emperor Ashoka confirmed the location of Buddha’s birth by erecting a pillar with inscriptions attesting to this; today, this monument is a UNESCO World Heritage Site famously known as the Ashoka Pillar. The Buddha’s birthplace being in Lumbini is something that the Nepali people are fiercely proud of. They celebrate Buddha Jayanti (the birth anniversary of the historic Buddha) on May 21st every year and it is a hallowed tradition regarded as sacred by this Himalayan nation. Thousands from all over the world fly to Lumbini to join in the festivities. But all of this is mere nonsense according to the 14th Dalai Lama. In recently-released footage on Rajdhani TV, the Tibetan spiritual leader dismissed this historic fact in a manner that was very demeaning to Nepal. The dismissal was all the more galling considering Nepal has been very kind to the Tibetan people, having hosted a huge Tibetan refugee community for over 60 years. Nepal, despite struggling with its own issues, has shown so much generosity to Tibetans by hosting some 30,000 to 40,000 refugees. This amounts to roughly a third of the Tibetan diaspora, and they are housed in 12 Tibetan refugee camps throughout Nepal. Tibetans who arrived in Nepal before 1989 benefited tremendously from the country’s economic and social integration. Many Tibetans opened businesses, shops and restaurants that are patronized by hordes of tourists who visit Nepal every year. In Nepal, they were also able to re-establish their Tibetan monasteries. Hence it would not be mistaken to say that Nepal contributed greatly to the survival of the Tibetan identity and tradition. And yet, this is how the Tibetan leadership repays them, by dismissing one of their beloved beliefs and sources of national pride. Since they first entered exile through the China-Nepal border in 1959, Tibetan refugees in Nepal have done extremely well for themselves. Amidst aging Nepali homes rise large golden-roofed temples which are as richly decorated inside as they are outside. 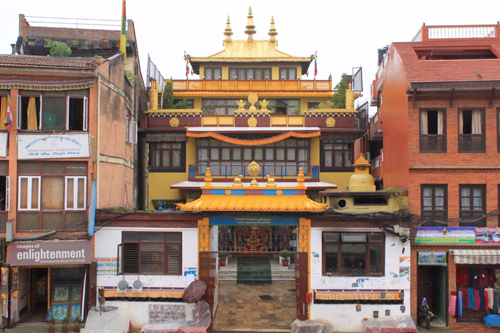 After the 2015 earthquake in Nepal, the Tibetan temples were often the first to be rebuilt, thanks to donations from all over the world. Meanwhile the Nepali people continued to languish outdoors in the elements for months, before receiving more permanent shelter. It was also during this time that some of the Dalai Lama’s associates were found to have been raising money on the pretext of donating to earthquake victims, but keeping the money for themselves instead. The Dalai Lama’s statement is very harmful to the Nepali economy. Spiritual tourism is one of the largest industries in Nepal, and it is an important source of foreign exchange and revenue, drawn no doubt by sacred sites like Lumbini. The Tibetan refugees themselves also rely on the Nepali tourist industry to draw customers to their various businesses. 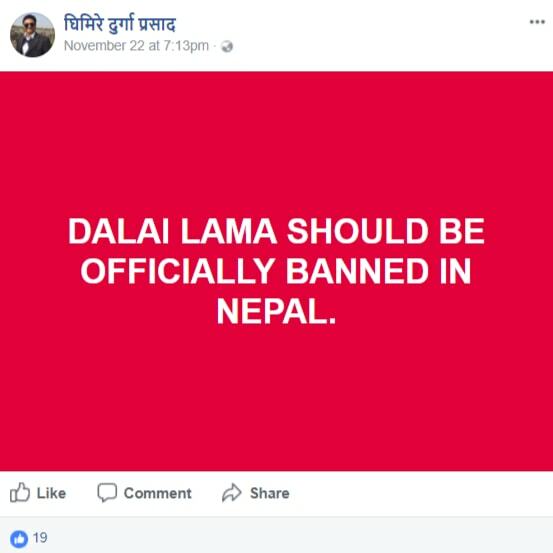 Therefore when the Dalai Lama makes baseless statements like this, it undermines the credibility of Nepal’s spiritual tourism. 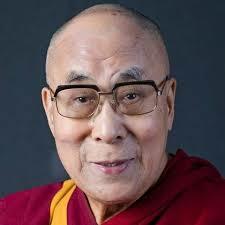 Many people in the world assume that the Dalai Lama is the head of the Buddhist religion and the supreme authority of all matters Buddhist, and therefore he must be correct about this. 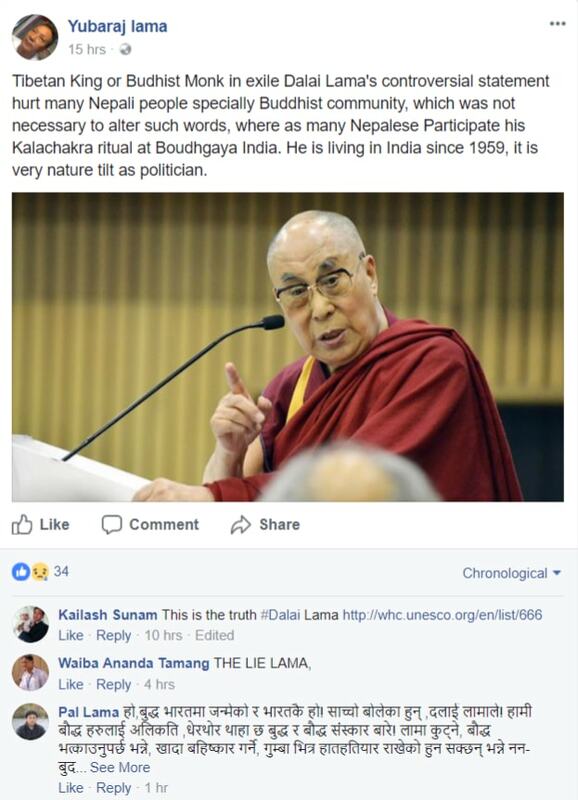 In the end, it is Nepal that will lose out because the assumption is, if the Dalai Lama himself said so, then Nepal’s claim to be the Buddha’s birth country must be a fraudulent statement. In fact, the Dalai Lama and his government, the Central Tibetan Administration (CTA which is based in Dharamsala) has shown little interest in the well-being of the Nepalis. Even during the recent earthquakes which devastated Nepal, the CTA merely issued a simple statement expressing sorrow, offered 20 lakh rupees (equivalent to less than USD 32,000) towards Nepali rescue and relief efforts, and promised to pray for Nepal. This is a pittance compared to the countless millions that the CTA receives annually in government grants, public aid and donations. In fact, while the CTA was offering this pittance, some of the Dalai Lama’s associates used the Nepal earthquake to raise funds for the victims, but failed to disburse the money to anyone. Their bank accounts were later frozen on charges of money laundering. It shows clearly that the Tibetan government is only interested in what it can gain from its friends and does not bother much with how it can contribute to the people of other nations. 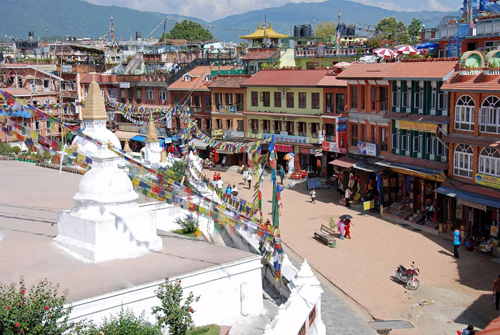 Some of the Tibetan shops surrounding the world-famous Boudhanath Stupa. Thousands of tourists visit this UNESCO World Heritage Site every day, and patronize the many wealthy Tibetan businesses there. Tensions have been rising in recent years against Tibetan refugees, who are accused of taking the best business spots and pricing out the local Nepalis. The Dalai Lama’s statement reignites a long-standing spat between India and Nepal over the right to claim to be the Buddha’s birth country. It was completely unnecessary for the Dalai Lama to raise this issue and reopen old wounds, especially when the spiritual leader owes a debt of gratitude to both India and Nepal. It also shows very poor diplomacy skills especially at a time when China is openly wooing Nepal with trade and the construction of important infrastructure. Angering the Nepalis in this way will only push them further into the arms of China, from whom they can benefit greatly by opening trade relationships. Ultimately, it shows that the Tibetan people are ungrateful and disrespectful even after half a century of contributions and support from Nepal. The Nepali nation has every right to be upset. The Dalai Lama being an elder statesman and a senior religious figure synonymous with wisdom and kindness must be fully aware of the power of his words. He is one of the most visible personalities in the world and, rightly or wrongly, a trusted public figure. Everyone has seen how the Dalai Lama has destroyed centuries-old spiritual traditions like the Dorje Shugden practice by simply declaring it to be demon worship, without furnishing any proof or explanations. Now, the same disregard is shown to the Nepali people. There cannot be any justification why the Tibetan leadership would inflict this blow on the nation of Nepal. 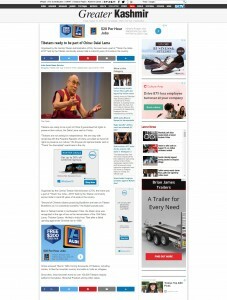 The anger of the Nepali people towards the Dalai Lama’s statement is justified. They have been very generous and tolerant towards the Tibetan refugees; the least that the Tibetan leadership could do is respect their history and culture. Every year, Tibetan refugees in Nepal launch protests against the Chinese government, forcing the Nepali police to allocate already-strained resources into policing them. These protests have a negative impact on Nepal’s relationship with China. 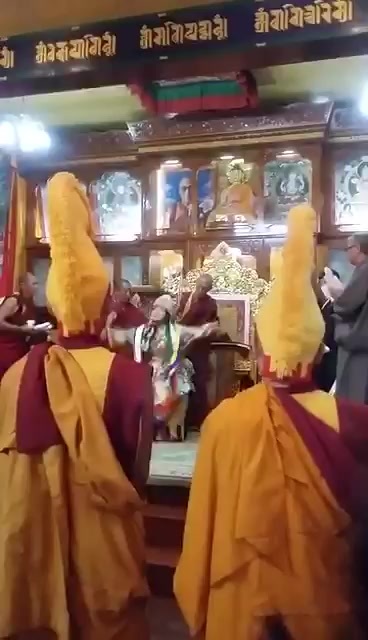 Is this how Tibetan refugees show gratitude to their Nepali hosts, by adversely affecting their host country’s economy and relationship with other nations, and their ability to provide for their own local people? It would behoove the Tibetan leadership to practice greater sensitivity towards the Nepalis in the future as the people are already very upset. Unlike the many other groups that the Tibetan leadership has insulted and maligned, there is much that the Nepali government can do in retaliation. For example, the CTA may now lose another one of their strong allies in the Himalayan region. 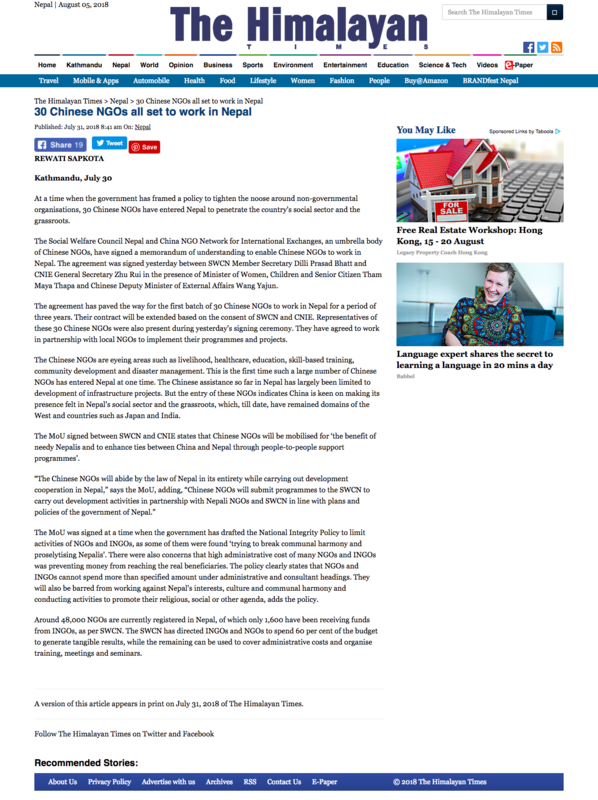 China is already extending a hand of friendship to Nepal and now, due to the Dalai Lama’s statement, the Nepali government has just been reminded that cultivating a relationship with the Tibetans will not benefit their country or people. The only result will be more grief, insults and violence. In contrast, a relationship with the Chinese will result in financial and trade benefits for the nation, as well as infrastructure improvements and economic growth. 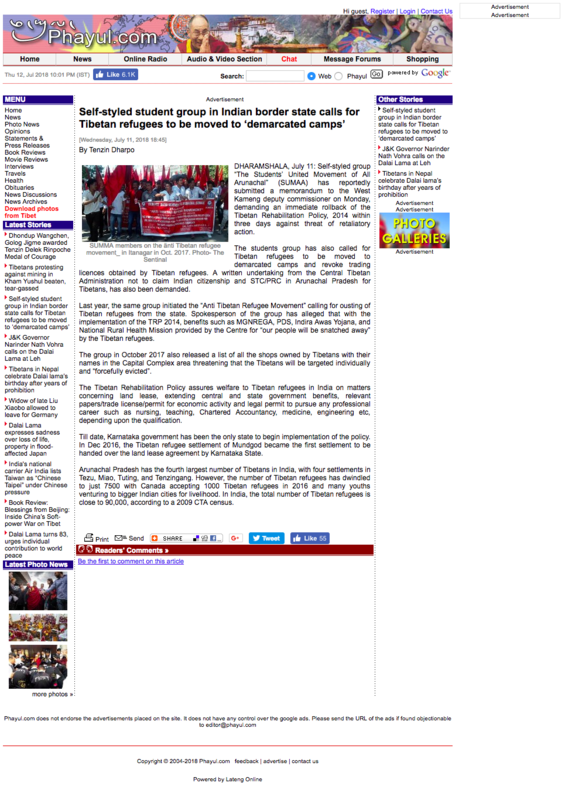 The CTA also fails to recall that the presence of Tibetan refugees in the country is totally reliant on the Nepali government’s continued patronage; without their support, the Tibetans could be asked to leave any day. How much longer can the CTA rely on the kindness of others, while they simultaneously insult and anger them? How much longer can the CTA survive in this way? At the rate they are going, the obvious answer is ‘not much longer’. 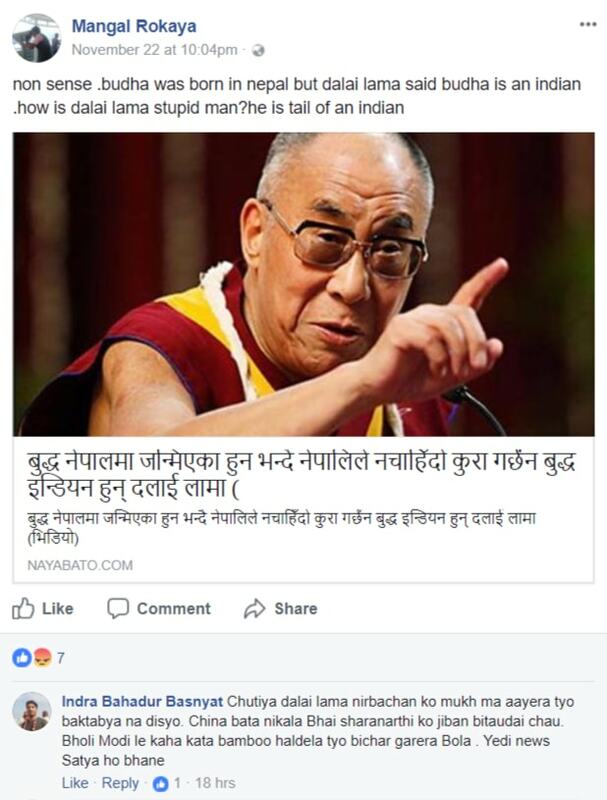 This is how the Nepalis are responding to the Dalai Lama’s statement that Buddha was born in India, and not Nepal. The Nepalis, as you can see, are extremely upset and are making their unhappiness known in official news channels as well as online on social media platforms. 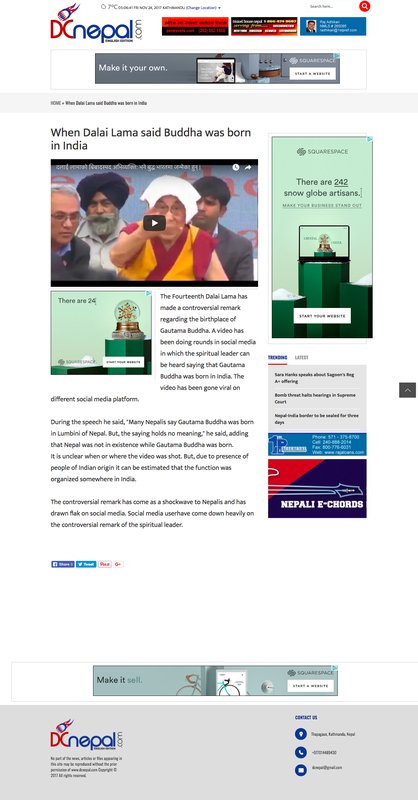 Videos of the Dalai Lama’s statement are also circulating and being shared widely. You can see below the numerous examples of the Nepalis’ reaction, and the strength of feeling that the normally peaceful people of this nation currently have against the Tibetan leadership and the Dalai Lama himself. The Nepalese officials have again turned down permission for Tibetan refugees to commemorate the Tibetan uprising day in order to protect its alliance with the Chinese Communist Party, which has proven to be more beneficial to Nepal as compared to supporting the Tibetan refugees. The Nepal Chief District Officer issued a written notice in 2005 to the Representative of the Dalai Lama and the Tibetan Refugees Welfare Office (TRWO) in Kathmandu to suspend both offices, ending a 45 years partnership to care for some 2,500 Tibetan refugees who would transit in Nepal from Tibet. This move was a lesson to the Central Tibetan Administration (CTA) for not addressing the tensions between the Tibetans and Nepalese, as well as not contributing back to Nepal for as long as they have been there. The fact that the Tibetan refugees continue to protest on March 10 is a perfect example in which they will jeopardise the relationship between Nepal and China, who is now the top assistance providers to Nepal. The Tibetan refugees are forever taking, and never reciprocating the favour has proven to be an ineffective way of dealing with the Nepalese as they feel they are taken for granted always. DHARAMSHALA, Mar. 8: The Tibetan refugee community in Nepal will not be allowed to commemorate the anniversary of the Tibetan Uprising day due this Saturday, after Nepalese officials turned down the permission to hold any “protests” or “public gathering” by Tibetans on the day. 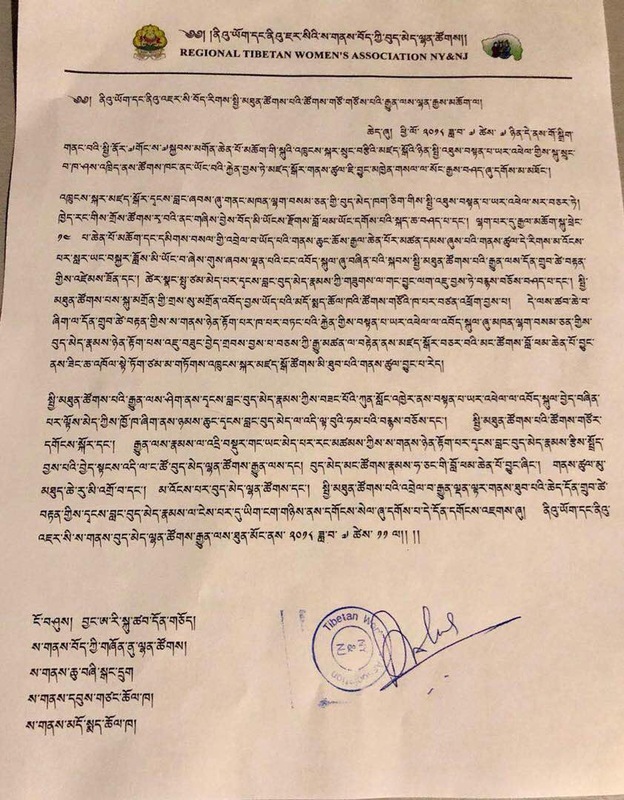 An official notice sent out by the Central Tibetan Administration’s ‘Tibetan Refugee Welfare Office’ in Kathmandu on Wednesday, appealed to Tibetans in Nepal to refrain from organizing protests or public gatherings on the day and instead pray from their homes. The notice stated that the Nepalese officials have turned down permission to commemorate the Tibetan uprising day this year as well like the previous years in the near past and that refugee Tibetans should abide by the laws of the land. The official appeal is most likely, in anticipation to avoid any violent interruption by Nepalese police towards Tibetan refugees, as were seen after 2008 when the tension was at its height following alliance between Beijing and Kathmandu. 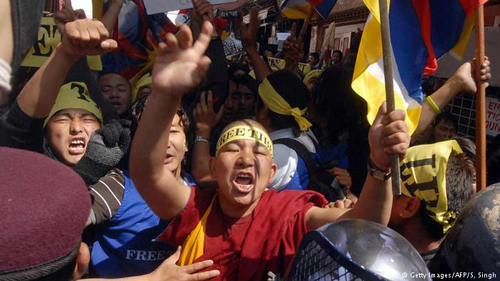 Over 200 peaceful Tibetan protesters were arrested on 10th March 2008 and over 1,100 Tibetans arrested prior to the Beijing Olympics for holding demonstrations the same year. Tibetan refugees have been subjected to clampdown by Nepalese police over the years on this day, which marks the uprising of the Tibetan people in Tibet in 1959 against the colonial Chinese rule. Nepal, a tiny Himalayan nation wedged between occupied Tibet and India was once a sanctuary for Tibetan refugees. Until the late eighties, the Nepalese government issued RC (Registration certificate) to Tibetans who came from Tibet as well as their children. A “gentlemen’s agreement” to continue allowing Tibetan refugees to cross over into India was struck between the government of Nepal and the UN High Commissioner for Refugees (UNHCR) in 1989 following the Kathmandu government refusal to give refugee status to Tibetans. However, that agreement has since been pushed aside after Nepal started receiving a lucrative patronage from China. The influx of Tibetan refugees has been severely restricted with the once average of 2000 immigrants a year dropping to a lowly 200 since 2008 Uprising in Tibet. In an extreme case of heavy handedness, 18 Tibetans including some children in 2003, and 3 Tibetans in 2010 were detained by Nepalese police and handed over to Chinese authorities in Tibet. Nepal which is home to more than 20,000 Tibetans who either came across the border or were born to settlers, are finding it hard to sustain a free and normal existence. 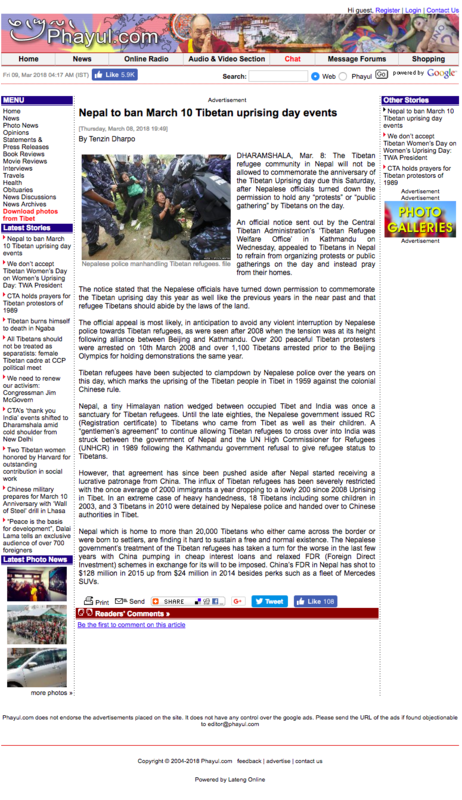 The Nepalese government’s treatment of the Tibetan refugees has taken a turn for the worse in the last few years with China pumping in cheap interest loans and relaxed FDR (Foreign Direct Investment) schemes in exchange for its will to be imposed. China’s FDR in Nepal has shot to $128 million in 2015 up from $24 million in 2014 besides perks such as a fleet of Mercedes SUVs. Indian and Chinese foreign ministries have both made statements thawing relations between the two Asian giants. Determined to improve ties between the countries, the Indian government is taking steps to ensure nothing jeopardizes their efforts. First, they told their officials to distance themselves from the Tibetans, and then the planned #ThankyouIndia2018 events were moved from New Delhi (India’s political capital) to the out of the way Dharamsala. Now, even Chinese ministers are hoping for improved relations, bringing stability to the volatile region. The Chinese dragon and the Indian elephant need to dance in order to become stronger said the Chinese Foreign Minister. Will this be the end of India’s support of the Tibetans? What will they do next? NEW DELHI — A pair of statements from the Chinese and Indian foreign ministries this week appeared to show an opening in relations between Asia’s most powerful rivals, long competitors on trade and territory. “The Chinese ‘dragon’ and the Indian ‘elephant’ must not fight each other, but dance with each other,” Chinese Foreign Minister Wang Yi said in Beijing on Thursday. If the two countries joined hands, he said, “one plus one will equal not only two, but also eleven,” referring to how powerful they would be together. On Friday, India foreign ministry spokesman Raveesh Kumar said Indian Prime Minister Narendra Modi and Chinese President Xi Jinping agreed that stronger ties “are a factor of stability amid today’s global uncertainties” at a meeting at Xiamen in September 2017. “We are willing to work with the Chinese side to develop our relations based on commonalities, while dealing with differences on the basis of mutual respect and sensitivity to each other’s interests, concerns and aspirations,” Kumar said at a news conference in New Delhi. Relations between the two countries have been fraught in recent months, as tensions escalated over border issues and Tibet, a semiautonomous region of China. But the statements could suggest willingness to cooperate. “I don’t think it’s a fundamental shift in the relationship,” said Shashank Joshi, senior research fellow of the Royal United Services Institute. “We are still looking at broad strategic competition between China and India, which stretches over the Himalayas and into the Indian Ocean. The statement doesn’t mean India is any less concerned on the Belt and Road initiative or the China-Pakistan economic corridor, but India does not want those disagreements to undermine relations,” he said, referring to China’s flagship program to increase connectivity in central, west and south Asia. New Delhi has refused to back the initiative, raising concerns it could directly link its two bordering strategic foes — China and Pakistan. Earlier this week, Indian Defense Minister Nirmala Sitharam said in parliament that both countries had redeployed troops at Doklam, the contested site of an intense standoff between the two countries last year. “The strength of both sides have been reduced,” she said, adding that the Chinese army had started the construction of sentry posts, helipads and trenches in the area. The statements came after unconfirmed reports in Indian media this week that senior government officials were asked not to attend events to mark the Dalai Lama’s 60th year in exile from China. Events for the Buddhist leader — whom China considers a dangerous separatist — were moved from New Delhi to the Himalayan city of Dharamsala, headquarters of the Tibetan government-in-exile. 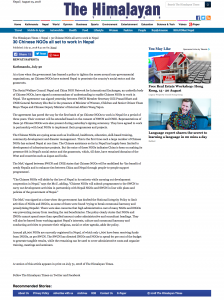 Nepal has developed so much since collaborating with China, with China now contributing to around 58 percent of foreign direct investment (FDI) commitments received by Nepal. China has promised that areas of mutual cooperation with Nepal would be expanded in the days to come. 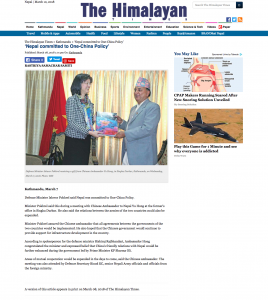 Defence Minister Ishwor Pokhrel said Nepal was committed to One-China Policy. Minister Pokhrel said this during a meeting with Chinese Ambassador to Nepal Yu Hong at the former’s office in Singha Durbar. He also said the relations between the armies of the two countries could also be expanded. Minister Pokhrel assured the Chinese ambassador that all agreements between the governments of the two countries would be implemented. He also hoped that the Chinese government would continue to provide support for infrastructure development in the country. According to spokesperson for the defence ministry Rishiraj Rajbhandari, Ambassador Hong congratulated the minister and expressed belief that China’s friendly relations with Nepal would be further enhanced during the government led by Prime Minister KP Sharma Oli. Areas of mutual cooperation would be expanded in the days to come, said the Chinese ambassador. The meeting was also attended by Defence Secretary Binod KC, senior Nepali Army officials and officials from the foreign ministry. By hosting the Pakistani Prime Minister Shahid Khaqan Abbasi when India-Pakistan ties are at an all-time low, Nepali Prime Minister K.P. Sharma Oli is telling the world that he is not afraid of India, especially after landmark trade and transit agreements were signed with China. This seems to go well with the general sentiments of the Nepali people, as Oli’s pro-China stance is wildly popular among his core constituencies. As mentioned in the article, New Delhi must learn to accept China’s presence in the region and to work with it. As China works on building trilateral cooperation with Nepal and India, the Tibetans will have no standing. Recently, the report that the Indian government had asked senior leaders and officials not to attend events that would mark the Tibetans’ 60 years in exile, as well as the cancellation of 2 events in Delhi, are clear signs that everyone is trying to please China. The Tibetans have no more sympathizers who will continue to support them as it risks jeopardising relations with China. Is This the End of India’s Influence Over Nepal? As India loses its clout, the Nepali prime minister asserts his country’s independent identity. KATHMANDU — There is now little doubt that India has lost strategic space to China in Nepal. Some reckon the era of “special relations” between India and Nepal is nearly over as China makes steady inroads. There has been a truly breathtaking rise in Chinese influence and a corresponding fall in Indian sway in this country of nearly 30 million. The main catalyst for the sea change? The 2015-16 India-inspired blockade of the India-Nepal border, imposed, in part, owing to India’s displeasure over the new constitution Nepal had just promulgated. But that is not how most Nepalis see it. Oli knows that the more he tries to assert Nepal’s independent identity by distancing himself from India, the greater his popularity will be. Following the 2015-16 blockade. which brought great hardship to common people, the public pressure for closer ties with China has been steadily building, along with the demand that Nepal diversify its relations away from India, heretofore its predominant business partner. This is where Pakistan enters the picture. By hosting his Pakistani counterpart, Oli — who crested the popularity wave as a valiant blockade-time prime minister — wanted to give a clear message that he doesn’t care what the Indians think of him. After all, his China tilt is wildly popular among his core constituencies. Moreover, the common perception is that Nepal is these days not as reliant on India as it has historically been, especially after the landmark trade and transit agreements signed with China in the wake of the blockade. It is true that Oli has also sought to mend his frayed ties with New Delhi following his election as prime minister. Indian Minister for External Affairs Sushma Swaraj visited Kathmandu on February 1 after Indian Prime Minister Narendra Modi got a clear signal from Oli that he was ready to forget past bitterness and start anew. Earlier, when Modi called Oli to congratulate him on his re-election and invited him to visit India, Oli not only accepted the invite; he replied that he was as keen to welcome Modi to Janakpur and Muktinath, the two holy sites in Nepal Modi has long wanted to visit. The inclusion of Madhesi parties in the Oli government is expected to further ease bilateral ties. Concerns over Madhesi representation were at the core of India’s concerns over the 2015 Nepali Constitution. There has, moreover, been progress in negotiations on the revision of old Nepal-India treaties that many Nepalis consider unequal. According to recent news reports, India is now ready to discuss regulating the open border, and even considering allowing Nepal to import arms from third countries. India had otherwise treated these issues as non-negotiable. These negotiations may again come to a naught. Nonetheless, Nepali interlocutors in these dialogues sense a definite shift in India’s stand. But current efforts to revive India-Nepal relations may be a case of too little, too late. Oli knows that for his political longevity he cannot afford an openly hostile India. But at this late stage in his political career, those close to him say, all he cares about is leaving behind a strong legacy as a statesman. With his health failing, Oli knows time is not on his side. He seems determined to be remembered as the Nepali leader who dared to dream of a future for Nepal independently of India. But not just that. Above all, he wants to be remembered as someone who took concrete steps to turn that old Nepali dream intoa reality. This is why even before assuming office after winning recent elections, he had vowed to expedite connectivity projects with China. To show he is serious he has newly empowered the Prime Minster’s Office to personally oversee their progress. There are other ways Oli can help China’s cause. During Abbasi’s Nepal visit, the two prime ministers agreed on reviving the moribund South Asian Association for Regional Cooperation (SAARC). India has in recent times made a concerted effort to isolate Pakistan, which is why the SAARC summit planned for 2016 in Islamabad had to be postponed indefinably. Abbasi came to Kathmandu to ask for Oli’s support for a prompt holding of the summit — and on Pakistani soil. Abbasi also in a roundabout way suggested that Nepal could mediate talks between India and Pakistan. India will not be pleased. The last time Nepal and Pakistan were seriously talking was on the eve of the 2014 SAARC summit in Kathmandu. Back then, the two countries had agreed to make China a full SAARC member, which had earned them the great ire of India. India has traditionally not taken kindly to any suggestion for third-party mediation on Kashmir, for example, or for China to play a greater role in SAARC. India nonetheless may have no option but to accept the writing on the wall. Rather than browbeat its neighbors into following its diktat, as it tried to do with the blockade — or so most Nepalis felt — New Delhi must learn to accept China’s presence in the region and to work with it. China has always supported the idea of trilateral cooperation with Nepal and India, for example with a connecting rail link via Nepal. But India has resisted the suggestion tooth and nail. 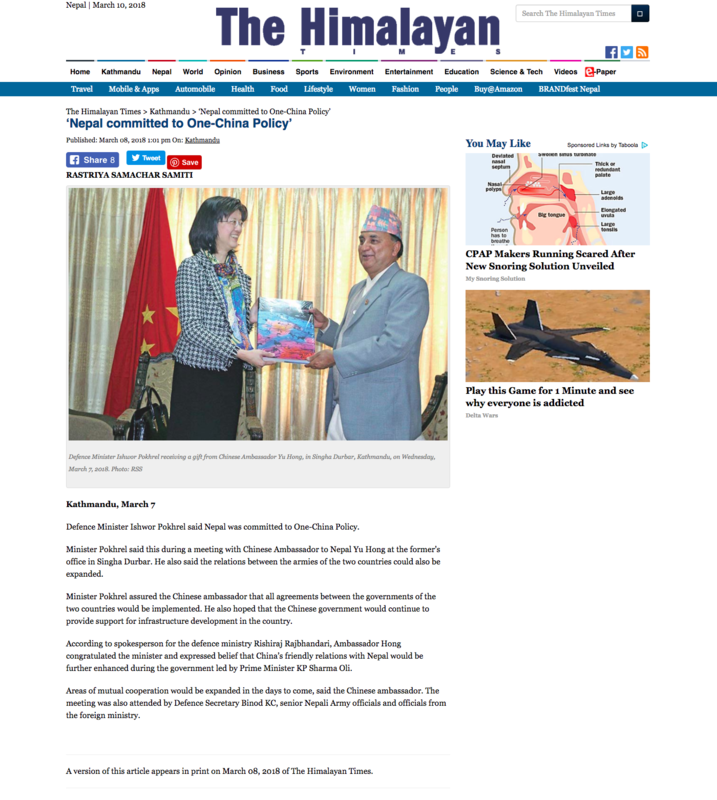 This is not to imply that closer relations with China are unquestionably in Nepal’s interest. The political systems of the two countries are polar opposites. There is also little people-to-people engagement, even though cross-border tourism and business exchanges are growing apace. Geography too makes India Nepal’s natural development partner. It would thus be unwise to write the obituary of Indian primacy in Nepal, as some have done of late. But the Modi government would do well to learn from its mistakes. These days in Nepal, there is no shortage of advice for India on how it can mend its errant ways, or forever lose even its reduced clout. The consensus is that only through open and unconditional engagement with small countries in the region like Nepal and Bhutan can India have a peaceful neighborhood that is conducive to its continued economic rise. A school of thought believes India cannot afford a conflict; its power gap with China is too large; it is neither militarily equipped nor economically positioned to take on Beijing. Over the past month, India has made a conscious effort to recalibrate ties with China. After a year of stress in the relationship, Delhi appears to feel that it is time to get ties back on track. Last Friday, ministry of external affairs spokesperson Raveesh Kumar told reporters India was “willing to work with the Chinese side to develop our relations based on commonalities while dealing with differences on the basis of mutual respect and sensitivity to each other’s interests, concerns and aspirations.” He also emphasised that ties between the two were important bilaterally, but also had regional and global significance. In diplomacy, statements matter – and so does context. There is definitely a degree of positive signalling on between the two countries. 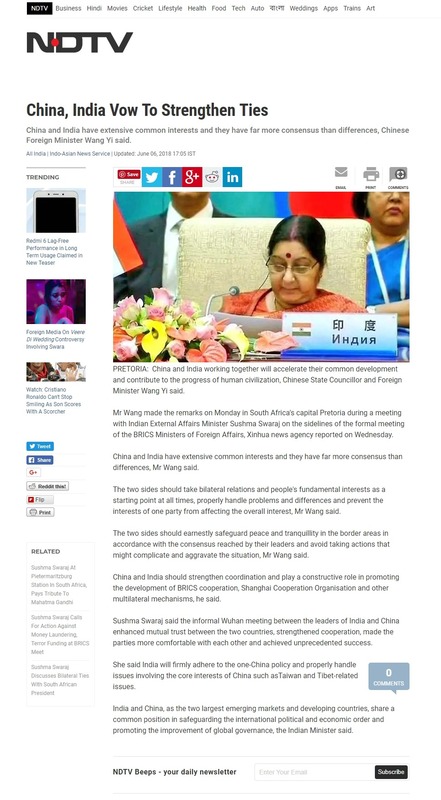 The statements follow foreign secretary Vijay Gokhale’s visit to China last month. 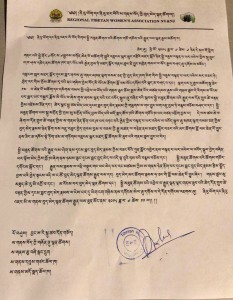 A note by the FS to the cabinet secretary, and his subsequent directive, that senior political leaders and government functionaries should stay away from events to commemorate Dalai Lama’s 60th anniversary in exile became public. It was widely interpreted as a move to assuage Chinese sensitivities, since Beijing views Dalai Lama with suspicion and Tibetan activities in India as political. A series of high-level visits are lined up between the two countries, including visits by external affairs minister Sushma Swaraj and Prime Minister Narendra Modi. There is buzz about a ‘high level visit’ from China. There are two broad schools of thought within the Indian foreign policy establishment, and the wider strategic community, about the reset. The first is those who believe this is essential. The argument goes something like this. India and China have had a turbulent time over the past few years. China’s decision to block India’s entry into the Nuclear Suppliers Group (NSG); its position on black-listing Masood Azhar in UN; India’s opposition to China’s flagship Belt and Road Initiative; and its deepening strategic engagement with Washington and positions on South China Sea have all contributed to trust deficit. The standoff in Doklam was a big blow to ties. And while an accident —in terms of a larger conflict — was averted, it showed the dangers inherent in the relationship. India cannot afford a conflict; its power gap with China is too large; it is neither militarily equipped nor economically positioned to take on Beijing; the US — under President Trump — is not a reliable partner. And thus, while protecting core interests like in Doklam, there must be an effort to normalise ties and build trust. It does not help to make China insecure. The second school of thought does not want confrontation either. But it believes that any effort to reset actually smells of weakness and could well reduce India’s leverage further. They hold that recent tensions are due to Chinese assertiveness – a result of its growing power and a reflection of President Xi Jinping’s personality. China’s deepening political engagement with India’s South Asian periphery; its expansion in Pakistan; its aggression on the land borders and Doklam are all instances of this new Chinese mood, which hurt India. In this backdrop, any ‘appeasement’ of China will embolden it further. India thus has no choice but to hold strong to any ‘cards’ it may have, including Tibet. It must bet on deepening strategic partnership with US as well as other countries with the ability to take on China. It must qualitatively step up the Quad (an initiative of India, Japan, US, Australia). And it must not worry about Chinese reactions. If anyone, it is India which has reason to be insecure – not China. When India is seen as strong, with options, Chinese behaviour will change. At the moment, the first school is dominant. Over the year, the equations in the India China relationship will be a key foreign policy story to watch. It is understandable that national ministers refrained from attending events organised by the Central Tibetan Administration (CTA) following the leaked classified directive from the Indian Cabinet Secretary. But to have a State Minister of Himachal Pradesh (that Dharamsala falls under) skipping such an important event for the Tibetans in-exile is a clear message – India is now making ties with China, and the ‘Tibetan cause’ (Tibetan independence) is no longer useful to India. 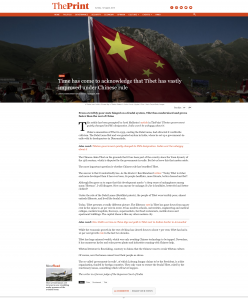 Over the past few months, the Dalai Lama has made numerous statements that Tibet should remain part of China. He has been reaffirming his stance that he is not seeking independence for Tibet. Meanwhile, India is exercising a whole new approach – to make friends with China. After all, India’s national interest comes first. 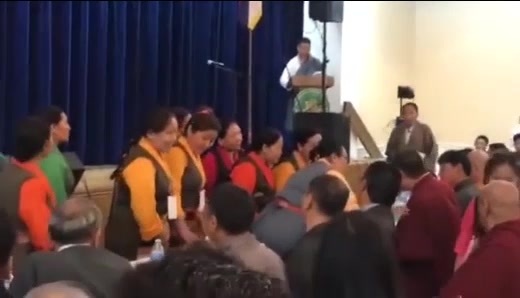 DHARAMSALA: In a major shock to the Tibetan administration in Dharamsala, state minister Kishan Kapoor, who was invited as the chief guest at the official function to commemorate the 59th anniversary of the Tibetan National Uprising Day, skipped the event. The minister and Tibetan minister evaded the queries in this regard. The event was organized at Tsuglagkhang (the main temple of the Dalai Lama at Mcleodganj) on Saturday. 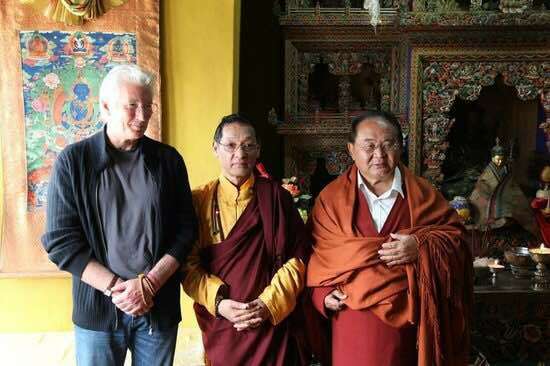 It remained a low-key affair owning to the controversy due to which the Central Tibetan Administration (CTA) had to cancel its ‘Thank You India’ event scheduled at Delhi on March 31 and April 1. Following the advisory, the CTA was forced to shift the event from Delhi to Dharamsala. It was presumed that the had its bearing on the Tibetan National Uprising day function. CTA had announced that the Kapoor, minister for food and civil supplies and an MLA from Dharamsala seat, would be the chief guest at the function. However, Kishan Kapoor failed to turn up. Only BJP MP George Baker was present at the event. 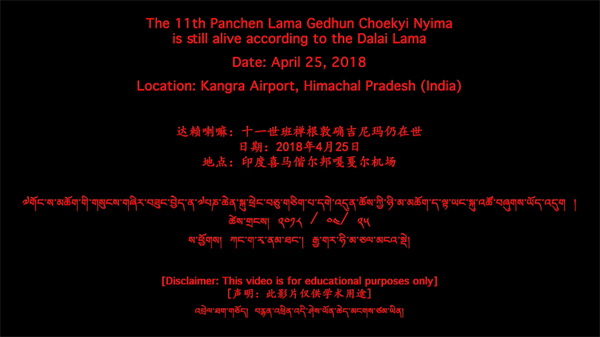 In response to the cancellation of the recent ‘Thank You India’ event in Delhi, the Central Tibetan Administration (CTA) released a video message by His Holiness the Dalai Lama saying that the Tibetans have not been seeking independence for Tibet from China since 1974. In addition, His Holiness further reiterate the mutual benefits of reconciliation between Tibetans in exile and China. This statement was very offensive to Indians who were very kind enough to host the Tibetan refugees for the last 60 years. Not only did the Tibetan community contribute nothing to India, they have also been using India in order to further their own cause. Now that India is changing their stance towards China, Tibetans are quick to turn around in favor of China and India is quickly abandoned. What is apparent in this speech is that India remains an undesired place to be called home. DHARAMSHALA: Days after a Tibetan event in Delhi was cancelled and shifted to Dharamshala following the Union government note to its senior leaders and government functionaries to stay away from them, Central Tibetan Administration (CTA) on Friday came out with a video message of the Dalai Lama, saying they have not been seeking independence for Tibet from China since 1974. The occasion for the Tibetan leader’s message is the organization’s 30th founding day anniversary. 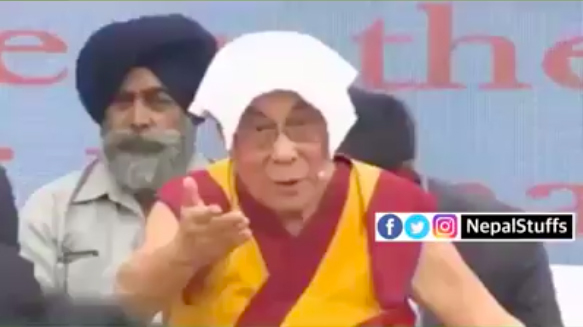 The department of international relation and information, CTA, released an eight-minute clip of this video message here, wherein the Dalai Lama has spoken briefly on Tibetan’s middle-way approach and the support it has garnered. “Since 1974, we decided not to seek independence. So, now the middle-way approach…. Common interest is more important than one’s own national interest. With that kind of concept, I am very much willing to remain within the People’s Republic of China. The Chinese word ‘gongheguo’ (Republic), shows some kind of union is there,” the Dalai Lama is heard saying in the message. 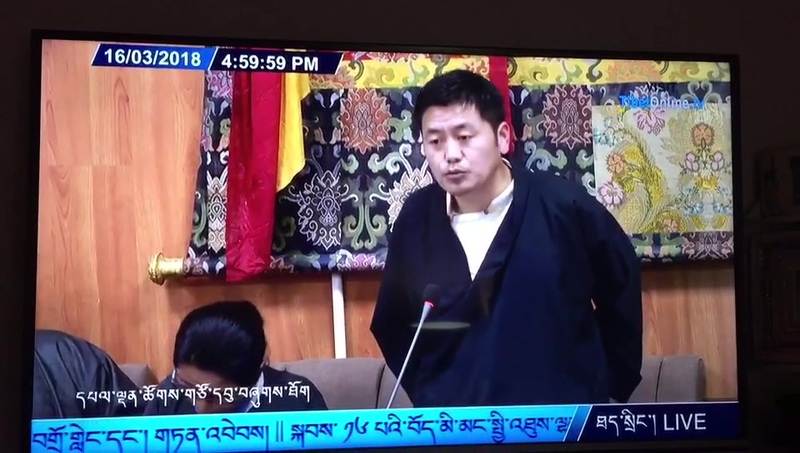 On June 21 last year, US Congress members of the Tom Lantos Human Rights Commission (TLHRC) petitioned President Trump to quickly name a Special Coordinator for Tibetan Issues. But according to the US Department of State website, this position is still vacant. Appointing a Special Coordinator for Tibet, though, is just one important step in solving the rights crisis of Tibetans. First and foremost the TLHRC and US Congress should realise that the human rights problems in Tibet can be overcome much more easily if India plays a proactive role. The Indian government currently has little interest in helping resolve the problem of Chinese repression over the border. Likewise the millions of Tibetans living abroad have mainly lost interest in the plight of Tibet since nothing has happened during the past 60 years to solve the problem. The impetus for change is coming from within China, among the 3 million to 6 million Tibetans who live there. But change will only come via a political solution that has the backing of the US (Congress and the administration) as we’ll as other international actors. Fortunately there are many Indians who are prepared to work towards, and even prepared to take pains in, solving the Tibet problem. The TLHRC should again urge President Trump to name a Special Coordinator for Tibetan Issues, but also to support any registered organisation in India (political or otherwise) – preferably through the National Rights Commission of India – which will work for the solution of the Tibet problem. Such organisations should also be able to spur the government of India into taking a proactive role. The Tibetan leadership is not as innocent as you would think. They are downright ungrateful. They have been using their freedom in India to irritate China and this has created tension between the two Asian countries. But now India is using the Tibetans, this time to improve ties with China instead. (1) Indian Foreign Secretary Vijay Gokhale met with both the Dalai Lama and Tibetan Prime Minister Lobsang Sangay to tell them to move their ‘Thank you India’ events out of Delhi, as India gears up to please China. (2) Gokhale told government officials not to attend Tibetan events, but he did not have to write his instructions down. These instructions were leaked. 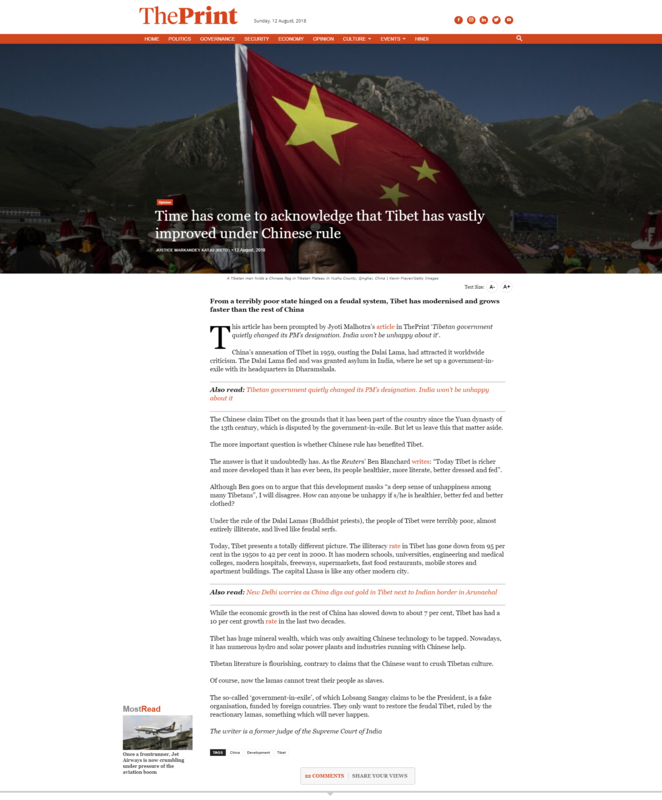 Some think it was intentional and hints at the fact it was both a ploy to let China know that India is changing its stance towards the Tibetans, and to let Tibetans know that it was doing so. (3) The leak was probably to slight the Tibetan leadership, who even went ahead with their smaller-scale events without coordinating with the Indian ministry. 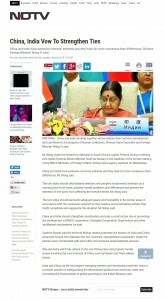 (4) Samdhong Rinpoche’s secret visit to China last year really irritated the Indian government. If the Tibetan leadership were to accept that Tibet was always a part of China, this would jeopardise the McMahon Line, and call into question India’s entire border with China. (5) The Tibetan leadership are not shy about stoking the fire during sensitive times. Lobsang Sangay even unfurled the Tibetan flag at Pangong Lake, near India’s border with China. He did this on Indian soil, but what made matters even worse, he did so during the Doklam standoff, when India and China were on the brink of war. There are serious issues which should be prioritised by New Delhi to avoid another Doklam-like situation. Are we witnessing a “Trumpisation” of the Indian foreign policy? Some signs tend to show that, like the Trump presidency, the Narendra Modi government is prone to changing its stance, principally in its relations with China, though “destabilisation” of the opponent might not be the Indian motivation, as is often the case with the American move. Take the programme “Thank you India”, planned by the Central Tibetan Administration (CTA) in Dharamsala. On February 22, foreign secretary Vijay Gokhale wrote to cabinet secretary PK Sinha, advising Indian government officials, including ministers, to skip the events organised by Dharamsala. Sinha obliged and ministries were informed to stay away from a function to celebrate the 59th anniversary of the arrival of the Dalai Lama in India. The Indian and foreign press abundantly commented on Sinha’s “leaked” missive. The MEA apparently said that it was not supposed to have been “leaked”, but India is an open society and such things are bound to happen. Now, despite the missive, two government representatives attended the function which had in the meantime been shifted to Dharamsala. Journalist Indrani Bagchi wrote: “After a stunning volte-face on its China policy that made it seem like India was suddenly kowtowing to China, India is trying to recalibrate its approach.” Union minister for culture Mahesh Sharma and BJP general secretary Ram Madhav participated in the Dalai Lama’s “Thank you India” programme. Gokhale had personally met the Dalai Lama and Lobsang Sangay, the Tibetan “president”, to ask them to move the celebrations outside Delhi. In order not to rock the boat with China, the government had earlier refused permission to the Institute for Defence Studies and Analyses (IDSA), funded by the ministry of defence, to have a conference on India-China relations in its premises in Delhi. A global parliamentarians’ conference on Tibet scheduled for April, was also not permitted. Apart from the latest summersault, which does not give a mature image to the Indian diplomacy, a question remains: why did Gokhale and Sinha need to put their warning in writing? China was certainly delighted by the circular, even though it has not incited Beijing to be “nicer” to India or accept compromises on any of the contentious issues between the two nations. For the last 60 years and more, each time India has kowtowed, China has given nothing in exchange. The best example has been the Panchsheel agreement. During the four-month negotiations in 1954, India surrendered one by one all its rights in Tibet, and hardly one month after the signature of the accord, the People’s Liberation Army started intruding in Barahoti, in today’s Uttarakhand, while a road was being built on Indian territory, in the Aksai Chin area. There is no doubt that the high-profile Tibetan event in Delhi would have irritated China, but why could the government not have discreetly informed the Office of the Dalai Lama and the CTA, that important visits were due in the coming months (defence minister Nirmala Sitharaman, external affairs minister Sushma Swaraj and the Prime Minster will soon pay visits to China) and that Delhi did not want any provocation which could trigger a new Doklam when the snows melt. South Block has a Liaison Office, with a senior officer posted in Dharamsala to communicate with the Dalai Lama and the CTA. 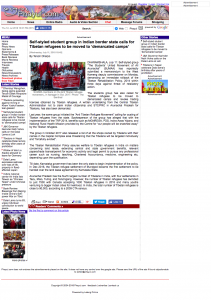 The logical approach was to send a message to the Tibetans explaining the situation. Some have suggested that the objective was to slight the CTA. This is possible and though not verified, it was rumoured that the CTA had gone ahead without coordinating with the ministry; if true, it would be a slip. It has also been said that the November 2017 clandestine visit to China of former Tibetan Prime Minister Samdhong Rinpoche had irritated South Block. The Chinese government would like the Dalai Lama to accept that Tibet has always been a part of China. That would create serious problems for India as it would mean that the McMahon Line, agreed to by independent Tibet and British India on the side of the Simla Conference in 1914, would have no legal worth. 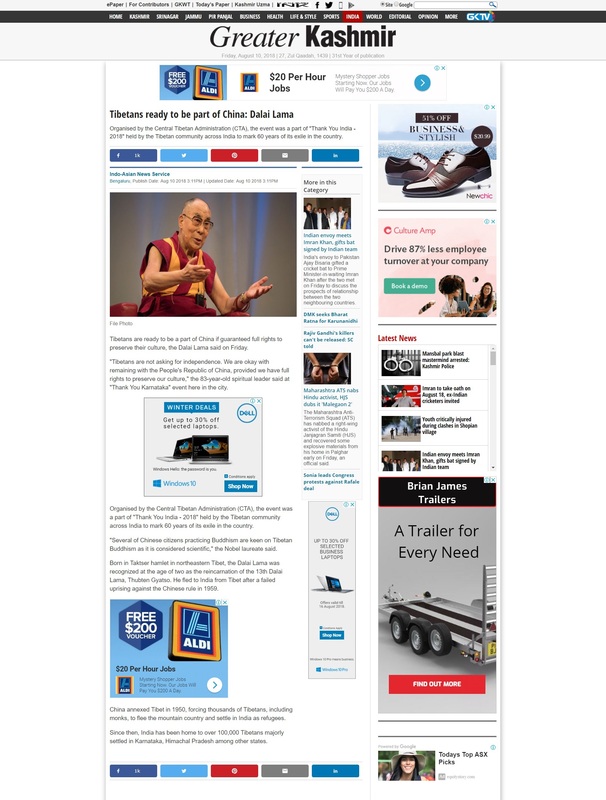 It is, however, doubtful if the Dalai Lama will ever concede something which is blatantly untrue. It is also true that the CTA has not always been sensitive to India’s problems. When during the Doklam standoff, Lobsang Sangay unfurled the Tibetan flag on the shores of the Pangong Lake, bordering Tibet in Ladakh, it was not very helpful to cool the tempers at the trijunction. In the meantime, deep reforms are taking place in China. For example, the United Front Work Department, which deals amongst other things with Tibet, has been given an increased importance, taking over the State Council Overseas Office, the National Ethnic Affairs Commission and the State Administration for Religious Affairs. Observers expect that it will translate into a tighter control over religion and ethnic issues, in particular in Tibet and Xinjiang. This has implications for India. These are serious issues which should be taken as priority by South Block while India’s Tibet policy should discreetly be fine-tuned in coordination with Dharamsala; one party should not embarrass the other. As for the “Thank you India” programme, one way for the Tibetans to “thank” India would be to reassert the India-Tibet borders in places such as Demchok, Chumar or Barahoti. In the meantime, “Trumpisation” will not help anybody… except for China.